Reduced Salt Ramen. Koyo Ramen noodles are expertly crafted from freshly milled, organically grown heirloom wheat, prized for its superior quality and light, delicate taste. Koyo's savory broth contains only pure, all natural ingredients, with no additives, preservatives or MSG. 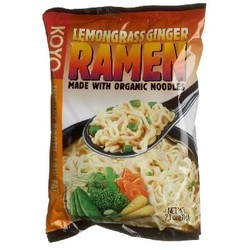 This delicious combination of silky noodles and flavorful broth will satisfy even the most sophisticated gourmet.